Fifth-grade student Judah Bromley, left, 10, son of Kristin Moore, and fourth-grade student Noah Houk, 9, son of Heather and Wayne Houk, write a description of a classroom job Monday at The Juniper School in Durango. The school has implemented mixed-age classrooms in which students from two different grades are together in one class. Cyrus Morgan, 6, son of Jessica Morgan, reads in his kindergarten/first-grade class Monday at The Juniper School in Durango. Cyrus, along with fellow students Reminysce Sillas, 6, daughter of Brittany Sillas, and Finn Lang, 6, son of Becky Clausen and Dirk Lane, were learning about the variety of flexible seating available during the first day of school. The school is using mixed-age classrooms in which students from two different grades are together in one classroom. 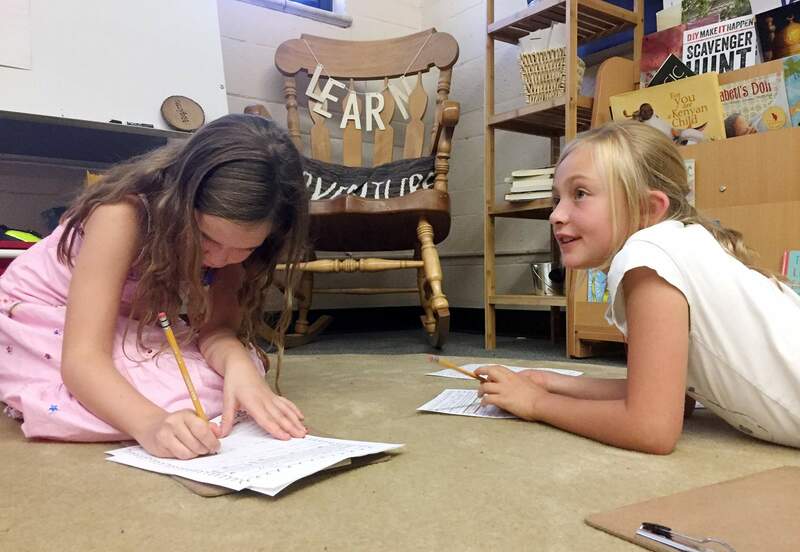 Second-grade student Arilyn Brown, left, 7, daughter of Kristin and Arthur Brown, and third-grade student Sydney McAllister, 8, daughter of Meredith and Michael McAllister, interview one another during the first day of school Monday at The Juniper School in Durango. The school has implemented mixed-age classrooms in which students from two different grades are taught together in one class. 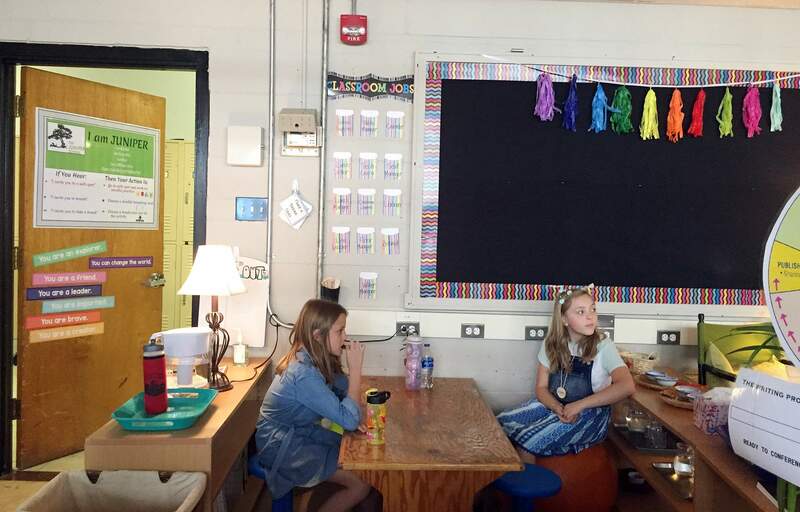 Fourth-grade students Evelyn Bopp, left, 9, daughter of Laine and Jessie Bopp, and Emmaline Uhl, 9, daughter of Ruthie and Jason Uhl, learn about classroom roles during the first day of school Monday at The Juniper School in Durango. The school has implemented mixed-age classrooms in which students from two different grades are together in one class. A teacher at The Juniper School in Durango might help a student in the morning, but in the afternoon, the assistance might come from a classmate, maybe a grade ahead or another student who has a particular knack for writing or math. 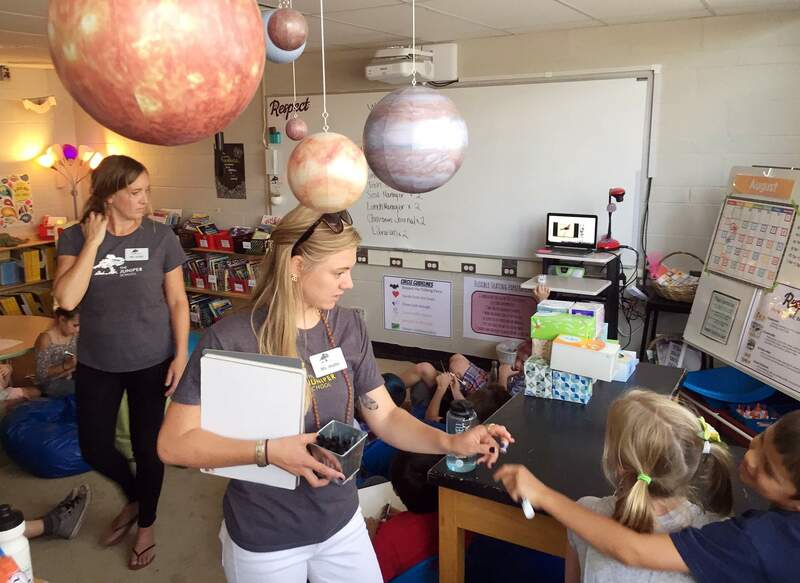 This year, the school has moved to a mixed-age classroom model with kindergartners and first-graders in primary classrooms; second- and third-graders in the intermediary classrooms; and fourth- and fifth-graders sharing the upper elementary classrooms. Monday was the first day of classes at The Juniper School. Noah Houk, 9, a fourth-grader, the son of Heather and Wayne Houk; and Judah Bromley, 10, a fifth-grader, the son of Kristin Moore, were helping to list different class jobs and define them. Both students enjoy having friends from different classes. Fourth- and fifth-grade co-teachers Kristin Harmon, left, and Hallie Venaglia hand out markers to their students during the first day of school Monday at The Juniper School in Durango. The school has implemented mixed-age classrooms in which students from two different grades are together in one class. Mixed-age classrooms have always been a part of the school’s charter, said Juniper Head of School Katie McCullough. The school delayed using mixed-age classrooms last year, the school’s first year of operation, she said, because relationships among teachers, students and parents all had to be built before the full benefits of the concept could be garnered. The Juniper School, which currently has 136 students and a waiting list, was in the development and planning stages for four years. The 2018-19 school year is its second year of operation. The charter school, located above Big Picture High School, 215 E. 12th St., uses a Montessori-inspired curriculum of student-driven learning that McCullough said gives kids a role in guiding their learning. Math, reading, writing and practical life-skill learning stations are in each class with tubs filled with various lessons, and students are given time to explore the tubs based on their interests. Third-grade students Hadley Miller, left, 8, daughter of Jennifer Miller, and Jasmine DeBoer, 8, daughter of Tiffany and Darrin DeBoer, interview one another during the first day of school Monday at The Juniper School in Durango. The school has implemented mixed-age classrooms in which students from two different grades are together in one class. 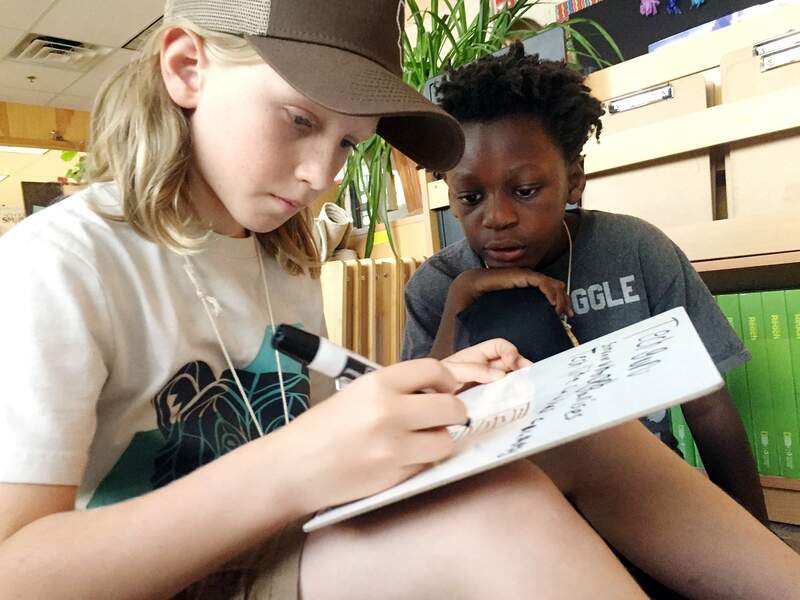 Student-driven learning creates increased responsibility among students, who are also guided by student learning contracts that involve the student, their parents and their teachers. Every year, one of each class’s teachers will move to the next age group, so that one teacher already has an established relationship with incoming students. 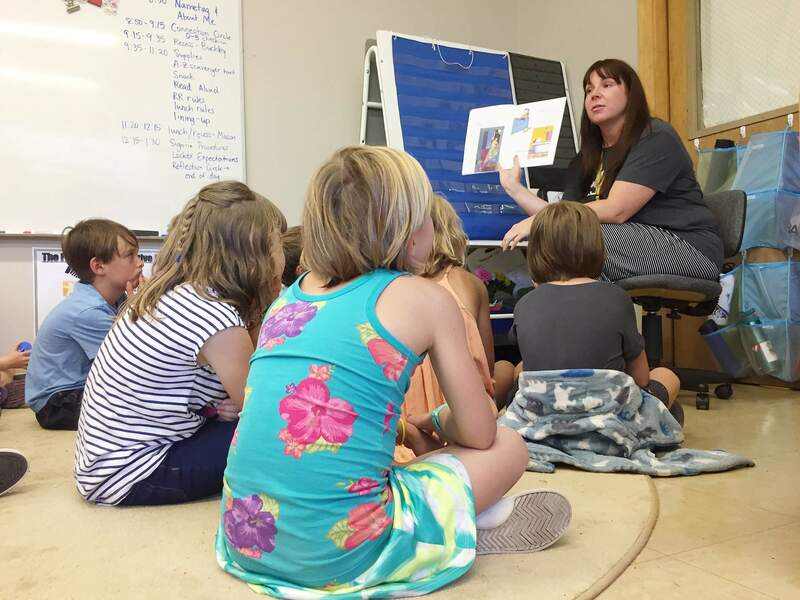 Second- and third-grade co-teacher Steffanie Schreiber reads to her students during the first day of school Monday at The Juniper School in Durango. The school has implemented mixed-age classrooms in which students from two different grades are together in one class. It means each year one teacher knows what skills students have been exposed to, and they already have relationships to build upon, McCullough said. 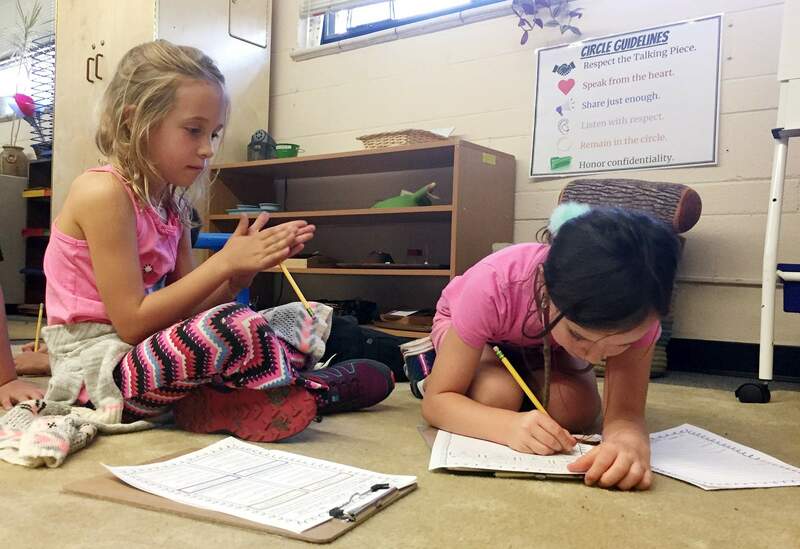 Two teachers mean the pair can take the time to devote special resources when students need special attention and instruction in subjects, and it allows students to review areas where they are struggling or move quickly to more difficult skills if they are excelling.